I was getting ready to post an elaborate excuse for why I haven't been sketching in a while, which included big freelance projects, nonprofits, the declining price of oil in the Middle East, and the major local-and-national distraction that is Travis ... but then, I took the early-but-full train to work today -- which meant I had to stand in the vestibule all the way. 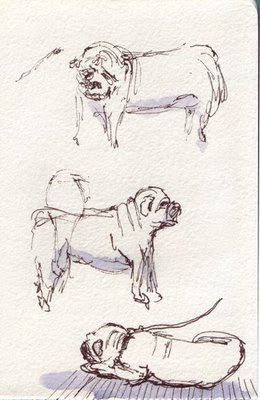 There was a woman sitting there with her dog on a leash, which made for fun -- if challenging -- sketching and watercoloring! So here it is. And please excuse the wobbliness, lack of proportion, etc. 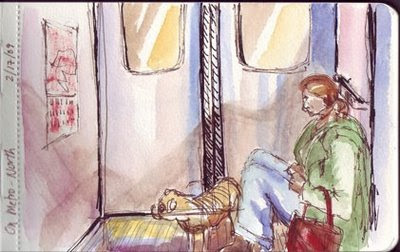 It's not easy to balance a sketchbook, pen, watercolor box and waterbrush on a swaying train.